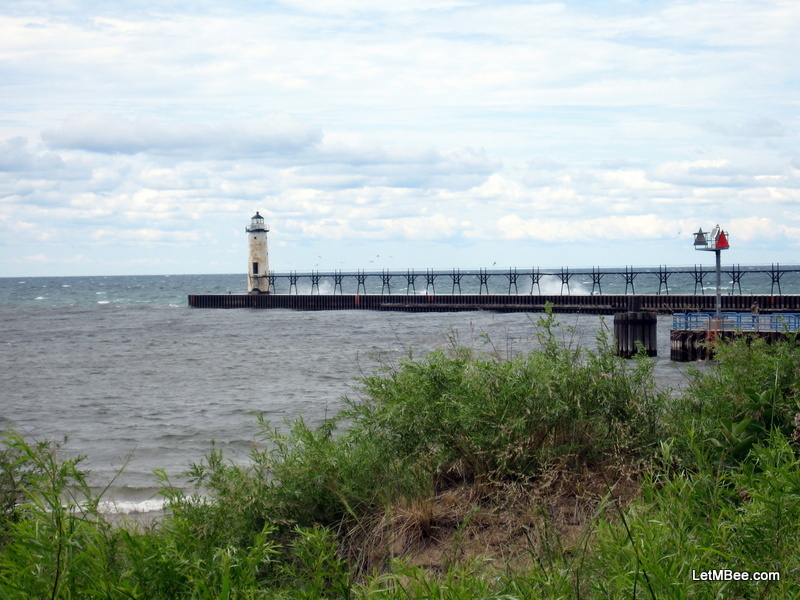 Waves crashing into the pier-head where the Manistee River flows into Lake Michigan. This day would have been pretty rough for fishing. It has been too long since a post has been made on LetMBee.com. I apologize for the delay. I went on a two week vacation salmon fishing on Lake Michigan out of the Manistee River. The camp ground I stayed in advertised Wi-Fi, but it was unavailable both of the weeks I was there. I found a public library in Manistee that had Wi-Fi, but I was too busy fishing, cleaning fish, and canning to leave. We caught our limit this morning (15). We boated somewhere between 85 and 100 fish in the two week trip. 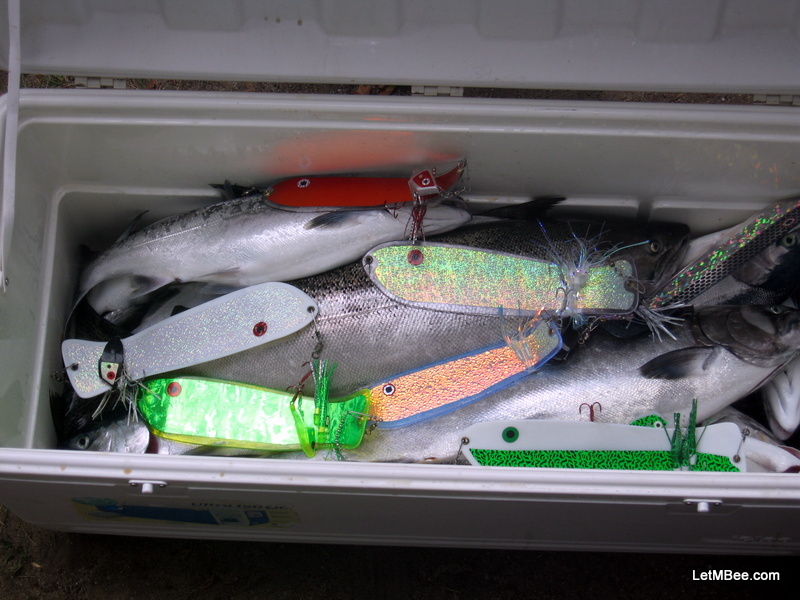 The species consisted of mainly Chinook (King) Salmon, Coho Salmon and Steel Head, along with a couple of Lake Trout. The fish were smaller than normal this year with an average weight around 10 pounds. We caught nothing above twenty pounds. I canned right at 100 pints while there. I have probably 30-40 more pints worth frozen waiting for a canning day. 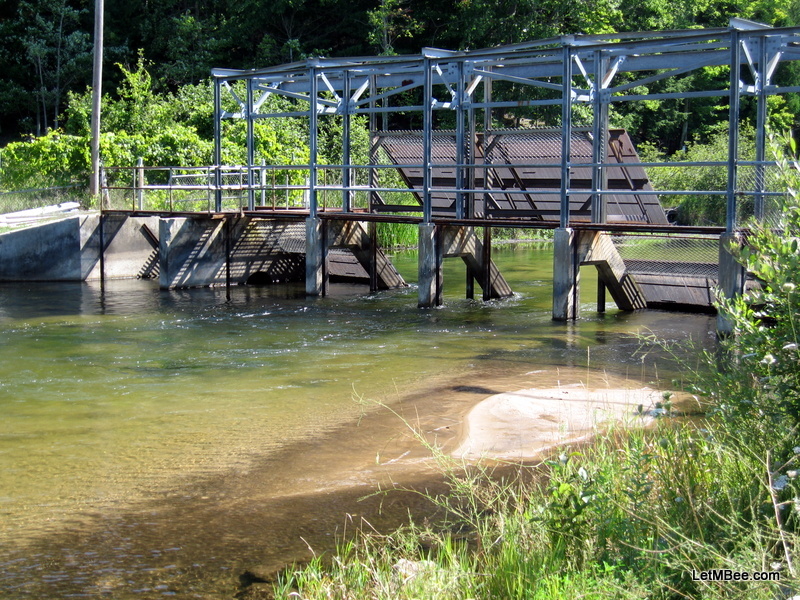 Weir on the Little Manistee River. 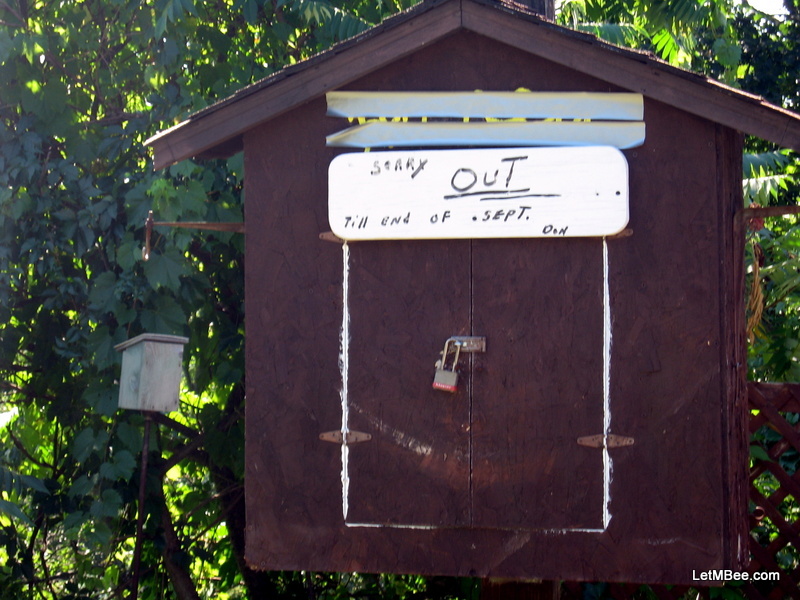 This trap is used to catch Chinook Salmon. Michigan DNR use the captured fish to breed the next generation of salmon. One windy day I took a trip to the weir that is situated on the Little Manistee River. On the way there I stopped and visited with a husband and wife bee-keeping team that had a honey stand on the side of the road. They were currently out of stock. The beekeepers told me that honey production was not very good in their area this year, but there would be a limited crop. They were going to spin honey within the next two weeks. There is a little update as to where I have been. I will try to avoid these long absences in the future. It looks as though this weekend will be a time for chicken processing. Honey supers will be coming off over the next week and a half. I will be taking pictures and keeping you posted. Wanna yell at me for not posting in such a long time? Leave a comment. Explain to me “canning fish”…sounds better thatn canning meat! It is almost exactly like canning meat only my recipe book tells me that I am supposed to have it in the pressure cooker 10 minutes longer than deer or chicken. Canning of meats is actually pretty easy, it just takes a lot of time. You just fill the jars with raw flesh, poke as many air bubbles out as possible, wipe the tops of the jars and put the lids on. I do mine at 10# of pressure for 100 minutes. Do you can? If not it is a great thing to learn to do. Cannot yell at you because I will probably be going MIA soon myself. I would have had some posts had Wi-Fi been functional. Now that I have been home things have been absolutely crazy. I have never seen a real salmon run. I need to find a way to become independantly wealthy so I can head to Alaska for a month or two (every year) to take it in. The fish taste good to me. I think they taste better than any salmon I have bought in stores. The only bad things is that with gas prices where they are the price per pound is astronomical. I enjoy the experience and knowing how the meat was handled. How long did you live in Alaska? You are lucky to have had that experience. I have been told the cost of living is higher there than where I live, probably less compared to where you live though.